You have probably heard that smoking is harmful to health for countless times. Those passionate smokers are very aware how difficult is to stop this ugly habit. There are many health hazards of nicotine contained in cigarettes. Nicotine causes a sudden increase in blood pressure and lung damage. It is very difficult to get rid of smoking side-effect after you have finally decided to lose the smoking habit. However, if you do stop smoking, nicotine effects will last for years. 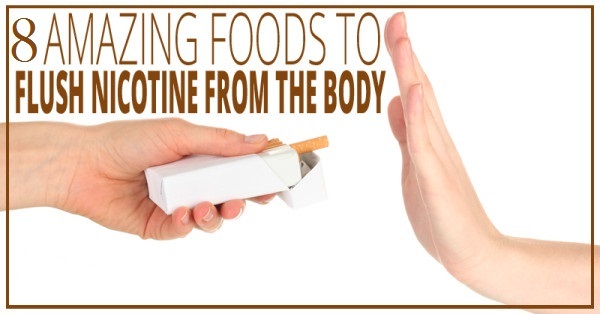 However, you can “flush out” the nicotine from the body with healthy food and altering your lifestyle. The fact is that smoking reduces the amount of vitamin C, E and A. These vitamins may protect the lungs from damage, so once you stop smoking, be sure to include in your diet foods that are rich in vitamins A, C and E. Take a look at which foods you need to eat in order to expel nicotine from your body. This green vegetable is a rich source of vitamin C and B5. Smoking reduces the content of vitamin C in the body. So, if you want to expel the nicotine from your organism, eat broccoli. Orange juice is a rich source of vitamin C. You can increase the metabolism of your body and get rid of stress, if you regularly eat oranges. If you smoke, then you should know that when you light a cigarette, nicotine remains in the body for three days. If you are a smoker, nicotine damages your skin. Carrot juice is good for the skin, and is also rich in vitamins A, C, K, and B, which help in the flushing of nicotine from the body. Spinach is the best dark green in the family of leafy vegetables, which is not only rich in vitamins, but also folic acid. If you are pregnant and are worried the rest of nicotine in your body, eat spinach. This red and juicy fruit helps blood circulation and increases blood cells in the body. To reduce the need to take nicotine, increase the pomegranate consumption. This wonder fruit helps in expelling nicotine from the body. The fruit is a rich source of vitamins A, C and E.
Berries such as strawberries help the “expulsion” of nicotine and other harmful toxins from the body. Smoking leads to dehydration. According to many researchers, you can stop smoking and reduce the nicotine out of your body by consuming a lot of water. This entry was tagged berries, broccoli, carrot juice, E and A, Green leafy vegetables, How to remove nicotine from your organism, kiwi, Oranges, pomegranate, vitamin C, water. Bookmark the permalink.